It’s spring! That means it’s time to open up the garage doors, take out all the junk and use it to construct deadly zombie-exploding weapons. At least, this is what spring cleaning involves for Tweet Defense’s main character, Luke. Through some unclear premise, Luke is left alone on an island full of slightly blue, brain eating zombies. Luckily for Luke, he is both a death-machine-building prodigy as well as an avid tweeter. Your job in Tweet Defense is to place Luke's zombie-killing machines in strategic locations to stem the incoming tides of zombies. In classic tower defense fashion, you can place new towers or upgrade current ones with money that you earn from killing the undead. The more followers you have, the better your weapons. The zombie killing machines look pretty cool: they range from your standard nail gun mounted on what appears to be a floor wax buffer to a really awesome high-voltage zombie zapper that’s mounted on a lawnmower. The electric tower is my favorite as it sometimes zaps the zombies so hard that they turn on each other. The zombies themselves offer a bit of diversity, although they only come in packs of similar zombies, showing that segregation is still a festering problem in zombie society. Normal zombies come at you with arms raised, while big fat butcher-looking zombies and limping, broken-leg zombies take longer to kill. The scariest zombies are the little baby zombies which high-tail it through you defenses (who knew babies could run so fast? It must be the zombie sickness) and pregnant zombies that when killed, pop out two baby zombies that keep coming at you. Weird and gross. One thing that all the zombies have in common is that they all die in a satisfyingly messy explosion of blood and bones. 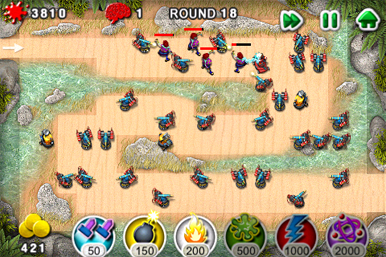 The game's graphics aren't anything spectacular given the zoomed out bird's-eye view, but you'll still be able to recognize the different zombie types and towers with ease. The island's environments don't provide much variety, just plenty of opportunities for mayhem. Tweet Defense’s game play offers a kind of lopsided challenge. Especially in the easy and normal levels, once you survive the first few waves, you have enough funds to safely sit through the rest of the stage, no problem. However, if you place your towers wrong in the first 10 seconds, that’s it, and all the zombies will probably get past you. Despite this weakness, I found the upper levels pretty challenging and even, dare I say, a little addicting. Now how does Twitter fit in to all of this? 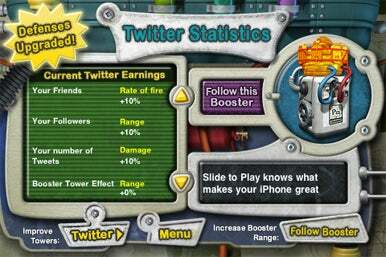 Tweet Defense seeks to capitalize on the popularity of Twitter to plug its game. I must say, I was pretty intrigued by the logo of a zombie with the Twitter bird sitting on its head. If you sign into Twitter through the game, it counts your followers and makes your weapons more powerful depending on how many followers you have. Although I’m sure it made my weapons more effective, the app didn’t do a great job of showing me exactly how much more effective. This gimmick didn’t give me the urge to try to gain more Twitter followers for the express purpose of killing zombies, and I quickly forgot about this element as I kept playing more levels. The verdict on Tweet Defense? I wasn’t convinced by the tweeting side of it, but I definitely missed a bus stop while playing this game. That makes it worth the $2.99.